When conditions permit, rangers groom trails for classic and skate-style cross-country skiing at ten of the forest preserves. You can also try calling the Forest Preserve Office at 630-933-7248. People may cross-country ski in all areas of the Cook County Forest Preserve (except in certain special-use areas: eg. golf courses and nature centers), from 8AM to sunset. The Arrowhead Golf Club offers groomed trails which you may enter or exit the Herrick Lake Forest Preserve. The course will be open when the ground is frozen and there is a 6" base of snow on the course. To reserve ski equipment, or for updates on skiing conditions and availability, call 630-653-5800 ext. 4. LakeShore Ski and Sports Club "Chicago's best place to meet new friends"
Nordic Fox Ski Club "The Chicago western suburb's largest cross-country ski club." Northwest Nordic Ski Club "...a non-profit ski club catering to Chicago area cross-country skiing enthusiasts, is dedicated to encouraging participation in cross-country skiing." 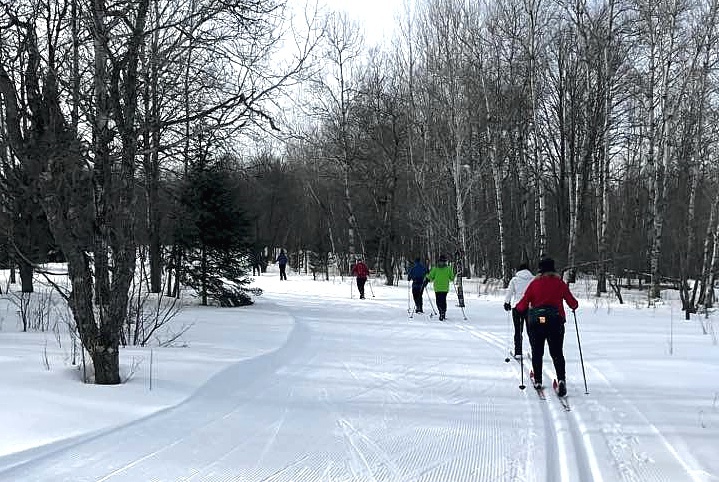 ABR Trails, Ironwood, Michigan "A full service ski touring center located on over 1100 scenic acres of varied terrain along the Montreal River in Ironwood Michigan." Slumberland Birkie / American Birkebeiner "(Hayward, WI) ...The mission of the American Birkebeiner Ski Foundation is:To promote and conduct the finest international cross country ski competition;To serve as good stewards of the American Birkebeiner Trail;To support healthy and active lifestyles among people of all ages and abilities." Chicago Metropolitan Ski Council "The Chicago Metropolitan Ski Council (CMSC) primary goal is to promote and support our member clubs in their effort to further the interest in skiing, snow boarding and year round activities - social activities." Cross Country Skier (magazine) "The Journal of Nordic Skiing"
SkinnySki.com "Narrow skis, wide coverage"